Clyde R. Van Dyke has resumed his duties as national advertising manager of The Journal-Tribune Publishing Company after spending three years in the Navy. Son of Mr. and Mrs. H. Van Dyke, 3914 Fourth avenue, he entered the midshipmen’s school at Northwestern University in the Spring of 1942 from which he was graduated as an ensign. He was assigned to sea duty on a Navy transport immediately after his midshipman’s training and most of the time was an assistant navigator. His ship carried troops from island to island and from the United States to island posts in the battle zones of the Pacific. As a lieutenant senior grade, he has been placed on the inactive reserve list of the Navy. Mr. Van Dyke has been in the newspaper work since 1934 when he joined the local advertising staff of the Tribune. 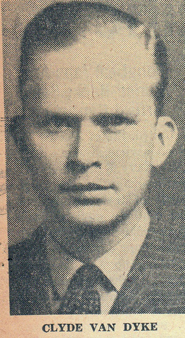 Later he worked for the Shreveport, La., Times and when he returned to Sioux City in February, 1939, he joined the advertising staff of The Journal. Later he was made national advertising manager.